Sorrento's intricate local inlaid wood furniture and art has been famous since the European nobility began visiting this stretch of coast as part of the Grand Tour in the 19th century. Still today, there are a number of workshops and galleries which show and sell everything from small inlaid boxes to breathtaking pieces of furniture. A jewelry box can be purchased at a reasonable price and is a perfect souvenir, decorated with classical floral designs or pastoral scenes, or you can opt for a more contemporary geometric pattern. It's easy to believe that the fountains of Sorrento gush pungent Limoncello instead of water when visiting Sorrento: this sweet, thick lemon liqueur is ubiquitous in the workshops, restaurants, and cafés of the city. Stop in one of the artisan shops for a limoncello tasting and choose which secret recipe you like best! 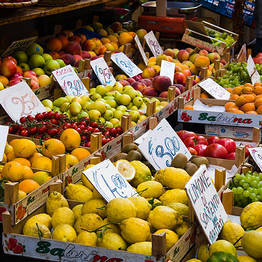 There are a number of lesser famous, but still delicious, citrus liqueurs also produced artisanally in Sorrento's shops. The most famous sandals in southern Italy are those made on the island of Capri, but there are a number of artisan workshops in Sorrento where traditional shoemakers handcraft sandals to measure. You can choose the leather, decorations, and heel height, and the artisan will craft a pair of one-of-a-kind sandals in your size (which, by the way, will cost you much less than those made in Positano or on Capri). 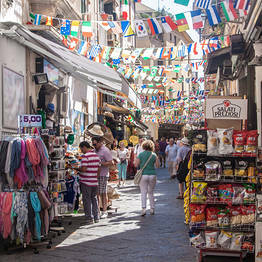 Experiences and Tours Day Trips and Tours to Positano, Amalfi, Capri, and Pompeii. More than 7.000+ tours booked online. Plan your trip to the Amalfi Coast, Capri, and Pompeii. More than 7.000+ tours and day trips booked online. A local producer of Sorrento's famed limoncello: workshop visits, tastings, and a shop selling artisan wares.